Dehradun Cabs a leader of cabs providers in not in Dehradun but all over North. Travel Delhi with us.Dehradun cabs will make your 255 km travel so easy and comfortable. If you have a plan for “Delhi Brahman” buzz us. Once we ‘ll get your query and your travel dates our representatives will coordinate with you to customized your travel plan. Dehradun Cabs will offer you pocket-friendly packages to visit Delhi. You can opt the one which fulfils all your needs once you step in Dehradun for any purpose. Dehradun Cabs has a squad of AC/NON AC/SUV/Luxury Cabs and traveler buses at very competitive prices which are unbeatable in all over Uttarakhand. Our packages also include the list of most exotic places to visit in Delhi or nearby area. 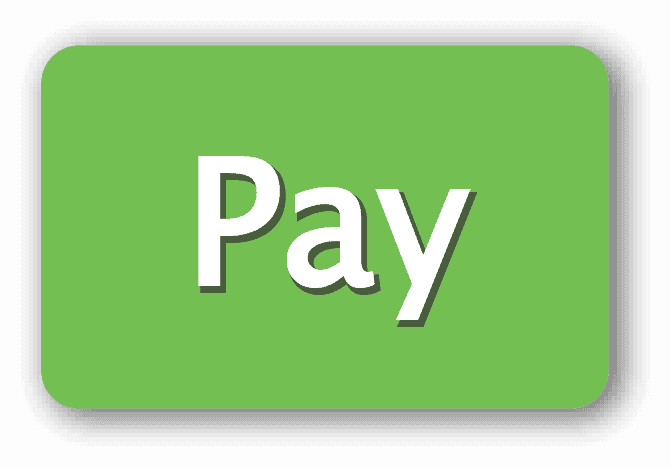 Hotel booking from affordable to comfortable, luxurious hotels is also what we can provide to you. You will be going to Delhi for a short holiday trip or business meetings or any urgent need you just need to ring us. Dehradun Cabs provide a fast comfy cab at your doorstep at the quickest. Our highly trained drivers would pick and drop you from any place in Uttarakhand and take you for a historical trip to Delhi. We can provide you pick and drop to International/Domestic Airport in Gurgaon. Dehradun cabs are always spacious enough to carry your heavy luggage. Dehradun Cabs believe in Genuity that’s why our charges are always genuine. And comparatively lesser for Delhi, as we don’t add any hidden charges or extra cost. Our Delhi tour package includes your arrival, hotel lodging, meals, sightseeing, local markets and your departure. Our expert chauffeurs are not only drivers but they are the perfect guide for you. Red Fort the proud momentum for Delhi. The Red Fort add glitters in the majesty of the capital of India. Its architecture shows the brilliance of Mughals art expertise. The Red Fort built by Shah Jhan in the 17th century between 1638 to 1648.Red Fort is the symbol of the lavish lifestyle of the emperors in that era. Red Fort has spread its boundaries in 2 km area. The height of Quila is varied from 18 to 33 meters. You can book Dehradun Cabs to experience the enchanting red beauty of this fort. Red fort is divided into many parts. Each part has named according to their functions .It has Diwan-i-am which is the place where emperor held the public meetings. Then there is Diwan-i-khas for private meetings. There is a Rang Mahal for the entertainment of emperors and their wives. Then you can visit Mumtaz Mahal as well. All these places were carved with mirrors, stones, and paintings. That gives such a magnificent look. Red Fort is too big and requires a day ti visit the whole. In the evening you can see the beauty of fort enlighten with lights and music. Dehradun Cabs will make your visit to Red Fort memorable. Akshardham is a divine adobe tribute to Bhagwan Swaminarayan.Akshardham temple has built in 2005 covering hectares of land. Akasardham is an eternal place of purity, devotion, peace, worship and culture. It has a huge architecture that echoed its history, religious messages and harmony. Dehraudn Cab will take you for a visit to this magnificent temple located in the heart of Delhi city. There are a mandir, the exhibition and the beautiful lavish green grass gardens. 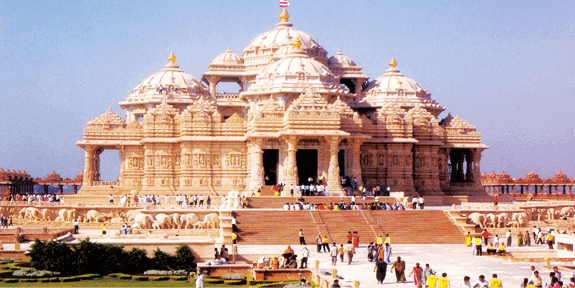 Akshardham Mandir has around 200 deities of different god and goddess. Once you book Dehradun Cabs this going to be a second place to visit. Akshardham visit again take a whole one day. As there is water show and lighting as well which you can galore at the night. The beauty of the Temple is so enchanting. Akshardham temple is so divine that you feel like god is given you blessings at the moment you step in to it. The next exotic place where Dehradun Cabs will take you for enjoy is Lotus Temple. Lotus temple architecture is highly inspired by lotus flower. The Bahá’í House of Worship was designed by an Iranian architect, named Fariborz Sahba. The structural design was undertaken by the UK firm Flint and Neill. The major part of the funds needed to buy this land was donated by Ardishir Rustampur of Hyderabad, Sindh, who gave his entire life savings for this purpose in 1953. The construction company was ECC Construction Group of Larsen & Toubro Limited. A portion of construction budget was saved and used to build a greenhouse to study indigenous plants and flowers that would be appropriate for use on the site. On an average, 8,000 to 10,000 people visit the Bahá’í House of Worship each day. These visitors have admired its universal lotus from design.You will fascinate by the interiors of this temple .So white and pious. Teachings of the Bahá’í Faith, especially its tenets of the Oneness of God, the Oneness of Religions,and the Oneness of Mankind. It is one temple amongst the seven temple of Bahai’s House of Worship all over the world. Along with the temple it has a huge green lavish garden and nine pools of water. Dehradun Cabs will make you feel awesome when you see this mesmerizing beauty of temple. 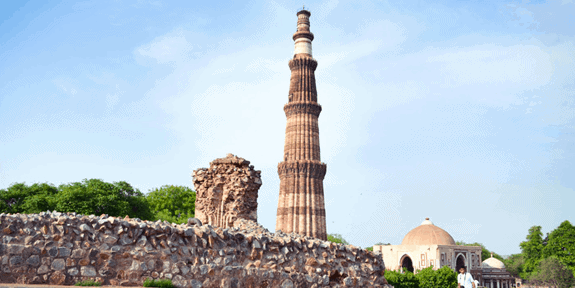 Dehradun Cabs during your Delhi Brahman will take you to one of the most visited historic places in Delhi i.e Qutub Minar.Qutub Minar is a soaring around 73 meter high tower built in 1193 by Qutub-ud-din Aibk.This victory tower has five distinct storeys. It is made up of red sandstone and marble. At the ground of the tower there is Quwwat-ul-Islam Mosque. This is the first mosque built in India. A 7 m-high iron pillar stands in the courtyard of the mosque. It is said that if you can encircle it with your hands while standing with your back to it your wish will be fulfilled. Qutab-ud-din Aibak, the first Muslim ruler of Delhi, commenced the construction of the Qutab Minar in 1200 AD, but could only finish the basement. His successor, Iltutmush, added three more storeys, and in 1368, Firoz Shah Tughlak constructed the fifth and the last storey. The tower is ornamented by bands of inscriptions and by four projecting balconies supported by elaborately decorated brackets. The Quwwat-ul-Islam Mosque is the one of the oldest mosques in the world that has to be seen. The main mosque comprises of an inner and outer courtyard, decorated with shafts and surrounded by pillar. Most of these shafts are from the 27 Hindu temples, which were plundered to construct the mosque. Dehradun Cabs will take you to this significant place of Indian History you will love to know the other facts and truths about Qutub Minar. Last but not the least is India Gate. 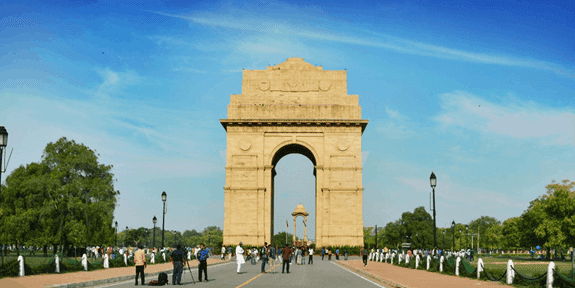 Dehradun Cabs will arrange your trip to India Gate. India gate is the pride of India. It is located at the center of Delhi. It has 42 m height. Its look like an Arc-de-Triomphe in the middle of a crossroad. It is a tribute to 70000 soldiers who lost their lives during 1st World War. The memorial inscripted the names of more than 13,156 both Indian and British soldiers killed in North Western Frontier in the Afghan war in 1919.Amar Jawan Jyoti was the another memorial which added after India got independence. There is an eternal flame which keeps lighting day and night as a tribute to the Indian soldiers of laid their lives in the Indo-Pakistan war in 1971. Another memorial, Amar Jawan Jyoti was added much later, after India got its independence. The eternal flame burns day and night under the arch to remind the nation of soldiers who laid down their lives in the Indo-Pakistan War of December 1971.India gate stands at the one end of Rajpath. India Gate surrounded with lush green lawns and a pool with fountains. In the night the lightening adds to wonder to the beauty of this huge monument. Dehraudn Cabs will drop you there and you can thoroughly enjoy thill the time you want. We don’t give you any time limit. We can’t limit your joy. So, plan for Delhi Tour book Dehradun Cabs. You just let us know your dates for travel we will pick you from your doorstep. Our dedicated team serve you whole heartedly to make your Delhi trip most wonderful trip. Dehradun Cabs is available 24×7 if there is an emergency also you can ring us we’ll provide you a taxi at the earliest for Delhi. We have a fleet of different comfy, AC/NON AC cabs or traveler buses. That makes you feel so comfortable. Dehradun Cabs have so nominal charges that cannot beat by any other taxi provider in all over Uttarakhand. You can have a look to these different cars and chose according to your need. You just need to tell us your budget.